The financialisation of the state is widely assumed but rarely analysed in detail. After all it is rather difficult to imagine that “the role of financial motives, financial markets, financial actors and financial institutions” (Epstein 2005: 3) can increase in importance without at least some support from public policy and institutions in this process. The recent collapse of the UK construction company Carillion, a major beneficiary of public service provision contracts, is a painful illustration that financialisation can have a profound impact on society through the state: thousands of private-sector jobs have been lost. However, much of the research on financialisation either leaves out the state entirely or simplistically assumes that the ‘rentier’, representing global financial elites, undermines production, dominates distribution and captures the state. To tackle this simplistic view, which omits state institutions’ (heterogeneous) interests and agency, this paper provides a structured overview of the nascent research area of financialisation and the state. 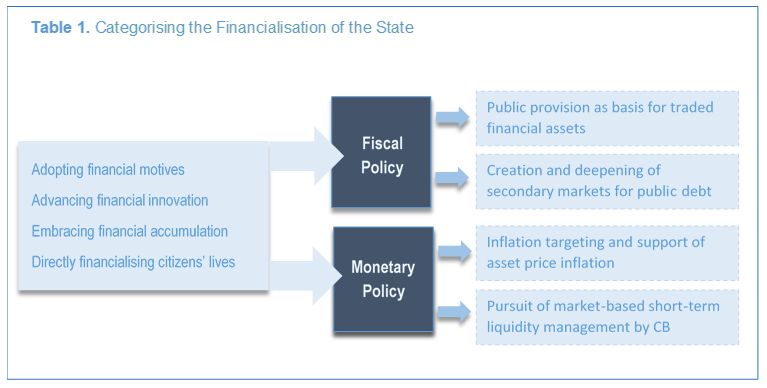 We focus on the macroeconomic functions carried out by state entities: fiscal and monetary policy. We define financialisation of the state broadly as the changing relationship between the state, understood as sovereign with duties and accountable towards its citizens, and financial markets and practices, in ways that can diminish those duties and reduce accountability. We find that there are four main ways how financialisation works in and through public institutions and policies: First, there has undoubtedly been an adoption of financial motives among public entities. For many governments balancing the books has been more important than sustainably providing high-quality services. In New Zealand, to take a specific example, this was a major motivation behind shifting from a pay-as-you-go scheme to funded pensions (Trampusch 2017). Equally, pleasing rentiers with low inflation rates has become paramount for many central banks across the globe, including in the global South where this aim is only achievable at the cost of high interest rates, thus raising the cost of domestic investment. Second, state entities have engaged in financial innovation, promoting and creating investment instruments and new financial markets. One of the more perverse outcomes of this trend are social impact bonds. Citizens’ lives, their vulnerabilities and needs, are packaged up into financial investment instruments and public services become the raw material for new financial assets. Projects addressing homelessness in the UK have been financed in this manner with an adverse impact on their quality and sustainability (Andreu 2016). Many rich governments such as New Zealand have also actively sought to deepen the secondary markets for their sovereign debt with funded pension provision feeding into this effort. Third, governments have engaged in financial accumulation, becoming active market participants that behave increasingly like private firms. For instance, central banks in the US, UK and Eurozone have pushed repurchasing agreements (repos) for banks’ liquidity management. Repos allow banks and financial firms to use asset-backed securities (ABS) in short-term borrowing operations, where cash is swapped against securitised collateral with the understanding that the ABS would be repurchased when the repo matures (Gabor and Ban 2015). As consequence, market-based short-term liquidity management is encouraged rather than ‘patient capital’. The European Central Bank (ECB) pushed repo market and its practices particularly aggressively. However, when sovereign debt problems among Eurozone members surfaced the ECB reneged on its duties as lender of last resort, behaving instead like a private investor and focusing on securing adequately-priced collateral (Gabor and Ban 2016). Finally, state institutions and policies have directly contributed to the financialisation of their citizens’ lives, for instance where the state provides student loans instead of free education. The question why state institutions have followed financialised policies is more difficult to tackle, and a full answer requires further research. Two main hypotheses emerge from the literature. It is either an opportunity to surmount budgetary constraints (Trampusch 2017, Strickland 2013, Torrance 2009, Datz 2008) or to push factional interests against established institutions or elites (Trampusch 2017, Davis and Walsh 2016, Lagna 2016). Research here stresses the heterogeneity of state interests among public institutions and their agency in driving the financialisation process. Nevertheless, once financialised motives and tools are taken on board they shape policy and public institutions, leading to regulation which structurally further entrenches financialisation (Preunkert 2017), sometimes even against the interests of the public representatives that advocated them in the first place (Pacewicz 2013). Read more in the Financial Geography Working Paper #11.